Heroin provides a high that is both cheap and very addictive. These factors of heroin use lead many people to start abusing it as a replacement drug for their expensive prescription painkiller addiction. Others abuse heroin on its own and suffer quick dependence, realizing they need heroin addiction treatment to break the cycle. Heroin is an illegal drug with a high potential for addiction. It comes from opium of the poppy plant. Manufacturers refine the opium, then put it through a chemical process to turn it into heroin. Manufacturers may create this drug in several forms, including white or brown powder, sticky black tar, and solid black chunks. Even though the heroin epidemic brings major attention to the dangers of abusing opiates, heroin remains one of the drugs that people most widely abuse in the United States. To administer it, individuals may smoke the drug, snort it or inject it using a needle. However you use heroin, the drug provides potent, quick effects. You never know what a particular dose will do to you, as each batch contains its own recipe. 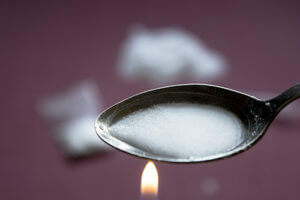 Street manufacturers make and sell heroin that contains a wide variety of filler chemicals. Each batch also differs in strength. This makes overdose a possibility with every use. People use heroin for its high. The drug creates intensely pleasurable feelings, including a surge of warmth and calm known as a rush. After this rush, you feel a heavy, slowing sensation in your arms and legs. You feel soothed and confident as you nod in and out of consciousness or sleep. When you first use heroin, you experience a range of feelings and symptoms. These include nausea, vomiting, itching and dry mouth. After these immediate effects, you feel some delayed symptoms of heroin. These are a range of signs your body is slowing down and slipping into a less active, less alert condition. The secondary effects of heroin include drowsiness for hours, a foggy mental state, slow heartbeat and slow breathing. You also experience nodding, a condition where you slip in and out of consciousness. When you abuse heroin, you risk addiction. Your body quickly becomes tolerant of the drug, requiring you to use more and more with each dose for the same effects. When dependence begins, you need the drug to feel and function normally. Physical dependence leads you directly to addiction. After addiction, the only way into healthy, strong and lasting recovery is heroin addiction treatment. Opiate overdose is a dangerous risk of using heroin. Any overdose, or even risking overdose by using the drug, is a clear sign you need heroin addiction treatment. Also, overdose kills thousands of heroin users each year. Signs of overdose include seriously slow breathing, slowed heartbeat, lost consciousness, permanent brain damage and coma. Of course, death sometimes occurs from a heroin overdose. This is why so many heroin users and their families keep naloxone on hand as life-saving medication for overdose. But having naloxone isn’t enough. Instead, it just prolongs your substance abuse when you really need lifesaving heroin addiction treatment. If you or someone you love need heroin treatment, contact Woodlands Recovery Centers now at (855)752-3377 for more information about available programs. You can have a better life.